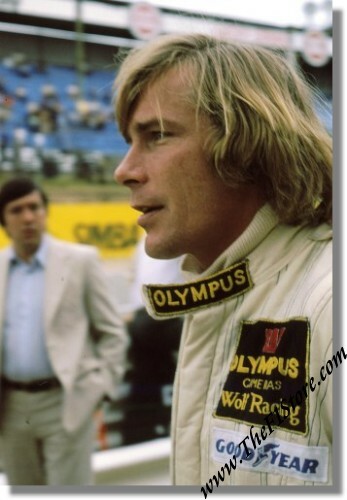 Vintage 1979 Color Slide - James Hunt - Olympus Cameras Wolf Racing. This is a vintage & original color slide of James Hunt in the closing stages of his racing career. Possession of this slide includes the copyright which means that you are free to reproduce it, also on a commercial basis! It is of professional quality. It is a 35 mm slide and of course in color. Original 1977 Zandvoort GP Race Poster. Great art work showing James Hunt's # 1 Mclaren M26. The race was won by Alan Jones in his # 17 Shadow DN8 ahead of Niki Lauda in his Ferrari 312T2. Carlos Reutemann brought his # 12 Ferrari 312T2 home in 4th place. It measures some 42 x 57 cm or 16.5 x 22.5 inches.